PRICE REDUCED! Great opportunity for prime farm land in Bell County! Located only minutes from both Troy and Temple! Easy access from FM 935. Electricity is also located along the FM road. Property is currently leased out for crops, and has always yielded record harvests of corn, cotton, and wheat. This area is able to produce more due to rich blackland soil, that has little to no rocks in it. A large creek area provides great drainage, tree cover, and also a great place to build a pond. Current ag exemption in place. 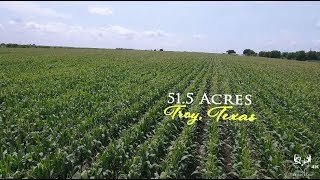 Great place to farm, ranch, or build a home. Buyers brokers must be identified on first contact, and must accompany buying prospect on first showing to be allowed full fee participation. If this condition is not met, fee participation will be at sole discretion of TX Rec Land, T. Arledge, broker.